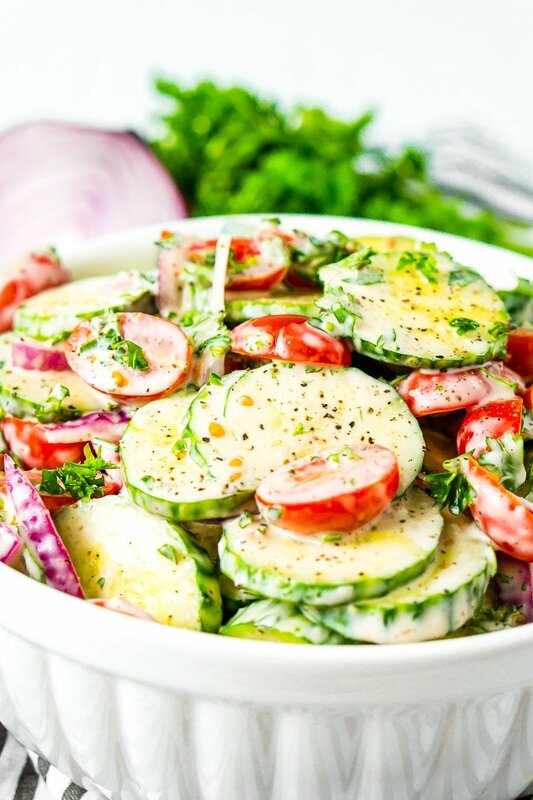 This Cucumber Tomato Salad is a simple and refreshing side dish that can be made with a creamy Italian dressing or a vinegar dressing. 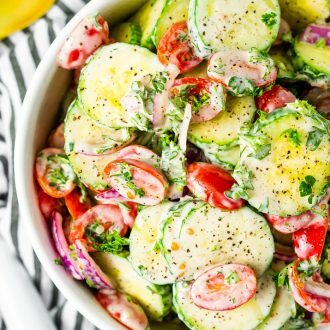 If you love the taste of sun-ripened vegetables but you’re bored of the old garden salad routine, this Cucumber Tomato Salad recipe will pull you out of your veggie rut with a few simple ingredients! 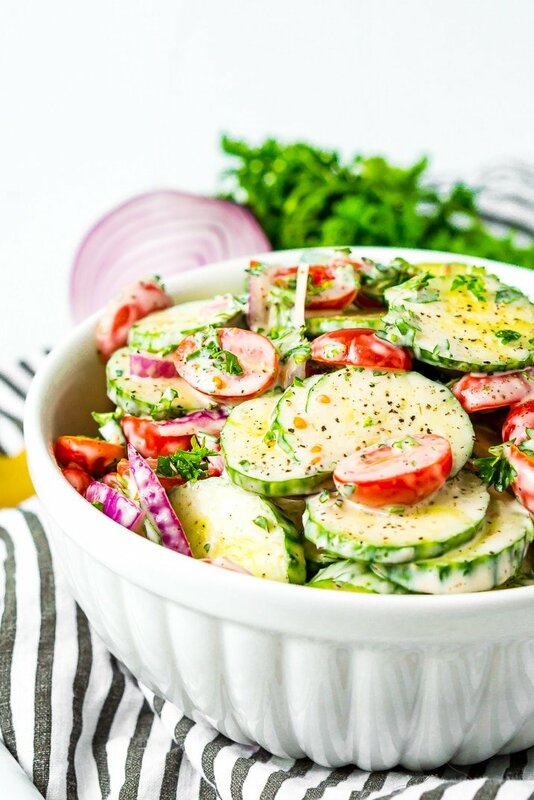 Cucumber Tomato Salad skips the lettuce filler and features two of the season’s tastiest vegetables. The flavors of crisp European cucumbers and sweet grape tomatoes blend with diced onion, fragrant parsley, and a few pinches of salt and pepper for a simple dish that puts a twist on traditional salads. JUST TAKE ME TO THE CUCUMBER TOMATO SALAD RECIPE ALREADY! If you’d rather skip my (very helpful, I think) tips and tricks, essential cooking info, and similar recipe ideas – and get straight to this deliciously easy Best Ever CUCUMBER TOMATO SALAD Recipe – simply scroll to the bottom of the page where you can find the printable recipe card. 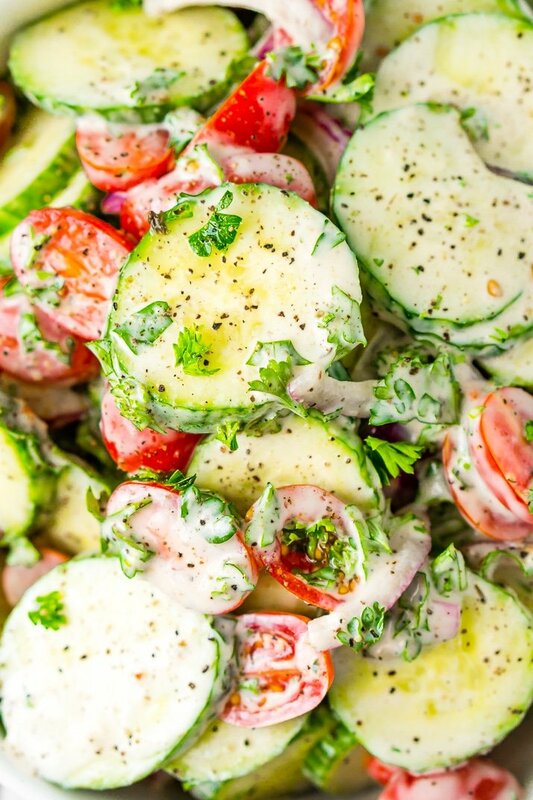 For a creamy cucumber salad, dress the ingredients with a creamy Italian or you can take a lighter approach and toss the veggies in a mix olive oil and vinegar. No matter which version you prefer, this cucumber salad recipe is cool, crunchy, and refreshing! It’s the perfect side to enjoy on a hot summer day, either with a meal or as a snack on its own. This recipe is so easy to make, and it pairs well with just about everything. Whip up a batch to share at celebratory showers, luncheons, parties, and of course, barbecues! That’s right, this cucumber onion salad dish tastes delicious when served with burgers, hot dogs, and grilled meat, too! It’s also a lighter choice than coleslaw, potato salad, and pasta salad for anyone who’s watching their waistline during cookout season. AND it’s ready in just 10 minutes! If you grow your own cucumbers and tomatoes, this is a wonderful way enjoy them. While I don’t garden myself, I do love visiting the farmer’s market in the summer to stock up on fresh produce, which always tastes best! Whether you want a crunchy side dish with your sandwich or you’re looking for something fresh to serve at your next gathering, Cucumber Tomato Salad is a simple, light recipe you can enjoy all summer long! 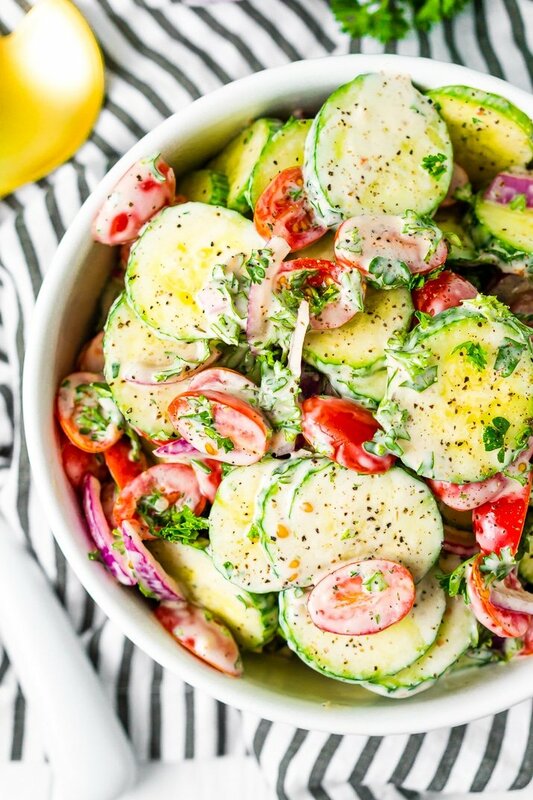 Pin this Cucumber Salad Recipe for Later! Prepare vegetables and herbs and add them to a large bowl. Toss with salt and pepper. Add dressing option of choice to the vegetables and toss to combine. Calories are calculated using the olive oil and vinegar based dressing. Store in the fridge and consume within 48 hours for best results. A big fan of cucumbers and tomatoes. This looks so fresh and colorful!! Thanks! Such a wonderful combo, looks so refreshing and healthy!